Matt Marcoux is captain of the vessel Daybreaker where he started crewing for his father in 1997. Matt started diving when he was six and became certified in 1994, eventually becoming a NAUI instructor in 2004. Currently Matt is a TDI and IANTD rEvo and JJ- CCR Trimix Instructor. Matt also holds certifications of advanced Trimix CCR and full cave CCR. Matt has dived many notable wrecks, also Floridian and Mexican caves, much of the Caribbean, and Australia but still loves diving in New England the best. Richard Simon is the president of Manta Industries and Highseas Millwork. He is a Boston Sea Rovers and Frank Scalli Internship winner, Richard is a PADI, TDI, and ANDI dive instructor holding both recreational and technical ratings- teaching everything from open water to CCR and trimix. Richard is an avid diver, enjoying wreck and cave diving. He has spent most of his life crewing on North-East dive boats. 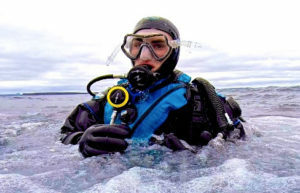 Alex Dulavitz – Alex is the co-owner of East Coast Divers and primarily teaches Sidemount diving, Technical diving, and rebreather diving there. Alex has been teaching rebreathers since 2005. Alex currently works with 3 units including the sidemount SF-2 eCCR. The SF-2 can dive either sidemount or back mount and is a fun, comfortable rebreather in either configuration. Joe Stellini – Joe is the northeast TDI/SDI representative as well as the Prism 2 instructor. An active diver for 20 years, Scott is the Northeast Regional Sales Manager for SubGravity and has been a professional dive educator for 10 years with a range of experience as an independent instructor, dive shop owner, and Caribbean resort manager. Scott’s own diving experience is well-rounded and ranges from laying line in virgin caves to CCR diving in every state of the Northeast. Deep wreck, mine, sump, and shore dives are all in his log book.